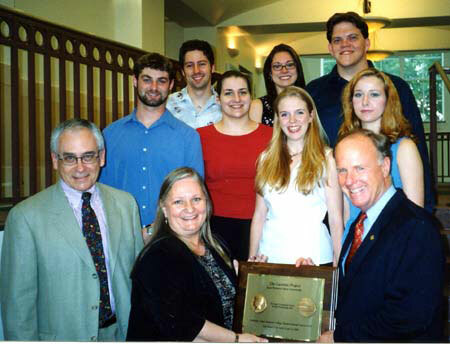 Theatre department representatives present James F. Gaertner, SHSU president, with a plaque they were awarded for being selected as one of only four colleges in the United States to perform at the John F. Kennedy Center for the Performing Arts in Washington, D. C. On hand were, front row from left, James R. Miller, department chair, Penny Hasekoester, assistant professor, and Gaertner. Students who participated in various productions included, second row from left, Spencer Plachy, Sarah Ripper, Haley Dyes and Chelsea Fry. Also, back row from left, Joel McDonald, Crys McDonald, and Kregg Dailey. The Sam Houston State University theatre department wrapped up an award-winning 2002-2003 academic year with a performance of "The Laramie Project" April 13-20 in Washington, D. C.
"The Laramie Project" was one of only four full-length productions from across the nation chosen to perform at the John F. Kennedy Center for the Performing Arts American College Theatre Festival, earning the department affiliate status with the Kennedy Center for 2003-2004. Patrick Pearson was chosen as one of two directors from colleges to work in the 2003 Summer Intensive Masterclass in the collaborative process between directors and designers at the Kennedy Center. The department's regional honors included an Excellence in Playwriting award to Ervin, Excellence in Acting award to Larry Routh, Excellence in Directing award to Penny Hasekoester, and Excellence in Ensemble Acting award to "The Laramie Project." The department received commendations for Support of Playwriting, for Continued Work with "Rich, Red Clay," and for Excellence in Overall Design. Several performers did well in the Irene Ryan Acting Scholarship competition, including Jeremy Sutton who was named best partner in the semi-final round and Spencer Plachy, Sofia Gomez, Dorcas Sowumni and Chelsea Fry who advanced to the semi-finals. Plachy, Gomez and Sowumni also advanced to the finals. Other regional winners included Crys McDonald for Excellence in Stage Management and "The Laramie Project" for Respondents' Choice for Best Production.